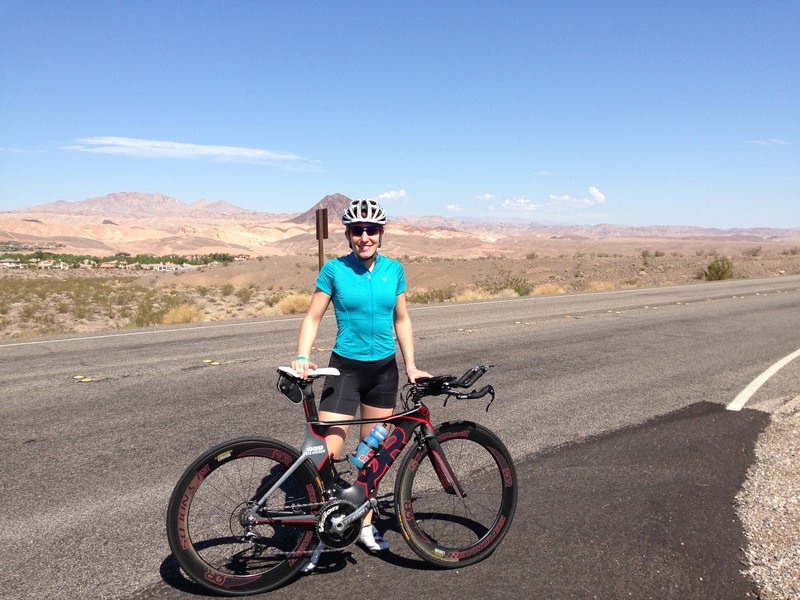 All my training and racing for 2013 was basically a build-up to the 70.3 World Championships, held in Las Vegas. I first qualified last year, finishing 1st AG at the Timberman 70.3, but I declined my spot. At the time, I didn’t really know where I was going with triathlon, and having just finished my first 70.3 – it was a bit overwhelming to have to make the decision to race over a year away. When I started working with Tim & QT2, we decided that I should try to qualify again and make that my A race for the year. In April this year, I qualified again, finishing 2nd AG at Galveston 70.3, and this time, I took the spot. I spent the next several months building up my bike fitness and gaining some experience in other triathlons, to get me more confident to be a better contender at a championship-level race. I had a string of wins and strong performances in the months leading up to Vegas, which started to make me really believe that I could compete for the top of my AG, as well as the amateur field as a whole. Of course, you never know who will show up on race day, but I knew there was a shot! I got into Vegas late Thursday night, and in the morning was happily surprised to see that my hotel room overlooked T1. I knew I was close to the start, but didn’t realize how close! Friday I did some work, put the bike together, then got in a ride along the course and a run with QT2 teammate, Rodney. Everything felt good, bike was in good condition, and I was mentally getting psyched up to race. Stopped by registration, picked up my new swim skin for the non-wetsuit swim (Thanks, BlueSeventy! ), and proceeded to stop at the Whole Foods for lunch, where was pretty much invaded by triathletes (proof – there were only 2 bananas left in the whole store when I got there!) Finally got back to the hotel to catch up on some Breaking Bad (my new current TV obsession). 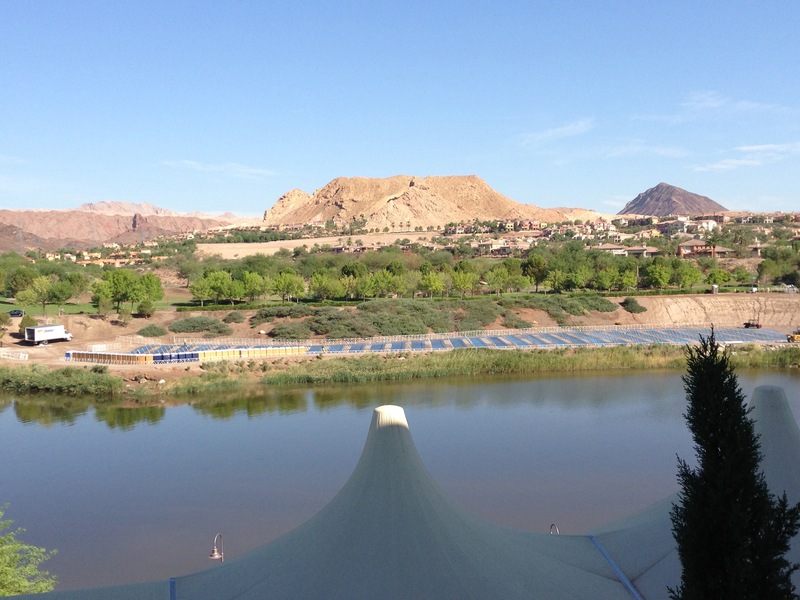 Saturday started with an easy practice swim in Lake Las Vegas. I had heard the water was murky, but it was so bad I couldn’t even see my hand in front of my face underwater! 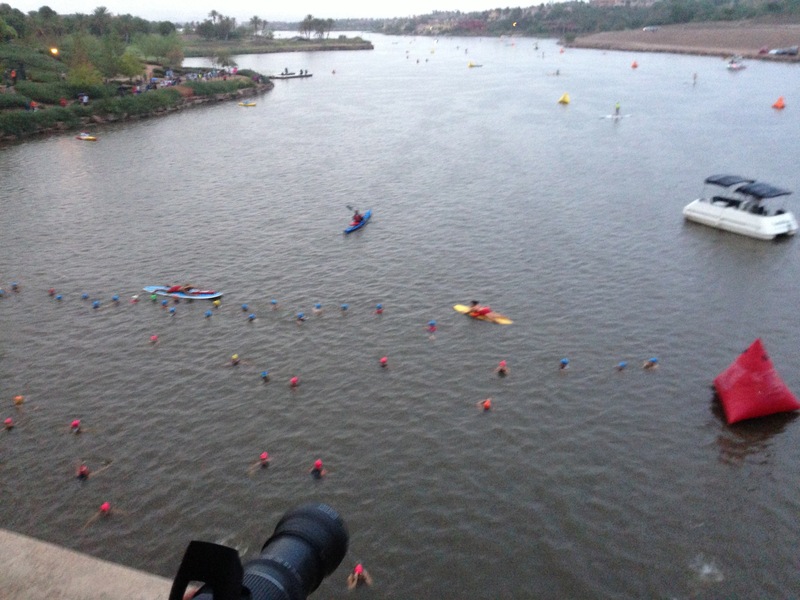 There were lots of people down at the swim, and you could feel the excitement for race day starting to build. This was followed by our QT2 team breakfast. There were only about 10 of us there, but we ate enough pancakes to feed 30. 🙂 I then went with QT2 teammate, Bruce, to T2 for run check-in. This race is unusual in that the two transitions are in different places. That meant we would finish the swim and get on our bikes in one spot, and then ride to an entirely different part of town to start the run. Logistically, this made things a little more challenging, but ended up not being too bad. Luckily, I could just walk my bike down from my room to T1. So I had the whole afternoon to lay around, talk to my family & friends (I was lonely being out there all by myself! ), and fuel and hydrate for the big day. I usually don’t sleep well the night before the race, but I managed to get in 10 hours on Saturday night! I woke up feeling awake and refreshed. As I got up out of bed, I noticed a sound outside my window – it was pouring rain! Not what I expected to be dealing with in Vegas, at all. I was expecting hot, dry weather…instead it was cold & wet. Well, ok. Roll with it! I stayed in the room as long as possible, until making my way down to T1. Got my bike and gear ready, and then hung out under the covered bridge with tons of other athletes. I was in one of the last waves, so I had about an hour and 15 minutes to wait after the pros went off until I started. The rain continued to come down, at times hard, and wouldn’t let up until well into the race. With about 15 minutes to go, I lined up with the other ladies in my age group. Everyone was very chatty and friendly. This quickly changed as we entered the water and lined up to start. This was one of the most aggressive starts I’d been a part of. I thought I had a good spot, but people quickly started taking over, and suddenly I found myself getting squeezed to the back! I was not about to let that happen, so I had to really stay tough to hold my position. Once the gun went off, it only took about 50 yards for the front group to emerge. Because of the large swim area, it ended up not being very crowded at all. I found some feet and held on for a bit, but she was a good deal faster than me, and I lost her pretty quickly. Then I was on my own…pulling a group of girls along with me. I was hoping to find some other feet, but it took until almost the first turn buoy. I found a pack just before the turn….and then I lost them! At that point, we were dodging the slower swimmers from the wave ahead of us, and I lost the group. Frustrated, I spent the next 500 yards or so trying to bridge the gap. There were a few stretches where I could really put my head down and swim, which helped me start to gain on them. I finally started catching them as we neared the end. I passed a couple girls before getting out of the water. Final swim time: 30:00. My slowest to date, but this was also my first non-wetsuit swim, and after seeing other splits and talking to other people who raced, it was slower for most. That’s when things started to get ugly. As I began to run out of transition, I noticed my hip flexors were getting really tight. I didn’t think too much of it as I got to my bike, figuring it was just a little twinge that would go away once I was moving. As I got my bike and headed out of transition, I knew something wasn’t right. We had to run up this hill to get to the mount line, and my hips/quads were just locking up. I could hardly run! I got on my bike and I couldn’t even push the pedals. I immediately threw it into the easiest gear I had, and tried to spin my legs out, hoping that moving them around would loosen them up a bit. As I crawled up the hill, girl after girl passed me. I was feeling no relief, the rain was pelting us, and for the first time during a race, I just started to cry. I was so worried that I wasn’t going to be able to ride my bike and finish the race, and even more worried that it would be a painful race with not the outcomes I wanted. But, I know better now. A year ago, I might have quit, at least mentally. But taking what I’ve learned from my year at QT2, I knew I couldn’t focus on the outcomes. Losing precious time on the bike wasn’t going to get me top of the podium – the competition at a race like this is too big for any mistakes. I had to refocus my thoughts on what I could control at the moment. Keep the legs moving and try to work out the muscle cramping. Try to get the heart rate up. Eat. Drink. I even took a couple salt tabs to make sure it wasn’t sodium related cramping. Sure enough, about 5 miles into the bike – the legs started to come around. I could push the pace a bit more, and the heart rate started coming up. My speed began to climb back to normal ranges, and I felt like I could put some power behind my pedal strokes. My legs would continue to be tight throughout the bike leg, but manageable. If I hadn’t been dealing with this, I think I would have really enjoyed the course. It is very hilly, but more long, gradual hills rather than steep ones. I have the strength to keep me going on the sustained efforts, so I think I could have done well out there. My time does not reflect what I was capable of doing on that course on my best day – but I think I pulled off a solid rebound from the earlier issues. I even started to pass a few women back on the 2nd half of the course, which helped me stay focused and positive. I had exited the water 6th, dropped to 17th during the beginning of the bike, and got back up to 14th by the end of the bike. As I neared T2, I grew increasingly worried about the run. My legs were still not right, and I was concerned about the first downhill mile coming off the bike. As soon as I got off my bike, I knew my worries were valid. My legs were seizing up as I made my way through transition. It was so painful running that first mile. Almost in tears again, I just dialed the pace back to where I could run somewhat normally. This continued on for the first lap (of the 3 lap course), though the uphill miles were slightly better since some of the pressure was taken off that part of my legs. I was so frustrated, because I knew I could run faster – my heart rate was low, but my legs just couldn’t go any faster. Little by little, I began to feel some relief. Starting the 2nd loop, the downhills felt a little less painful. I started to see my pace drop a bit, and my heart rate start to climb back up. By the halfway point, I started to realize that I might still be able to pull together a decent run. Again, not what I am capable of on my best day, but good enough to make up some ground. I was passing people easily, especially on the uphills. I noticed a few of them were 25-29 AG, so I knew I was moving up in the field. At this point, I had no idea where I stood among the age group, but I was going to pass as many people as I could in the final miles! The last loop felt great, at least comparatively to the rest of my day. There were a number of other QT2ers out on the course, and everyone was so supportive. We didn’t have a ton of people out there, so every one of you that I saw that gave me a smile or high-five – THANK YOU for helping me get through the race! So many emotions were going through me when I crossed that finish line – relief that I had finished, disappointment that I had not had the day I wanted, pain from my legs that began to seize up again, but feeling proud that I had fought through the day and finished strong. I knew it was nothing I did “wrong”, and I probably did all the right things to deal with what I had that day, to salvage a decent race. I was happy to find out that I had run my way to 4th in my age group – a podium spot. Though going into the race I had hoped to finish higher, this was better than I thought the day had gone. I had passed 10 girls in my age group on the run, running my way onto the podium only in the last few miles. I’m not going to lie, I’m disappointed in how the race turned out. I know I had it in me to go faster, definitely on the bike & run. But I am so grateful that I had to opportunity to race with the best 70.3 athletes in the world, and that I was able to stay in the race and finish strong. I didn’t give up, and stayed tough even when things weren’t going my way. I’ve been lucky to have a string of good races where things just fell into place, and I felt good. I think this will fuel the fire – makes me want it even more next year. Not taking for granted the good and great days. 2013 was an amazing start to what I hope will be a long, exciting, and rewarding journey in the sport. A big HUGE thanks to Coach Tim & QT2 Systems, for giving me the tools I need to execute on race day, and the confidence I needed to stay in the game. Also a big thank you to my friends and family, for being there for me throughout the season. Even though I was bummed that no one could join me out in Vegas, the amount of support I got from back home was incredible. Every call, text, FB and twitter message reminded me how lucky I am to have such a great support system! And of course can’t forget our awesome QT2 sponsors, who help us become the best athletes we can be! Special thanks to Quintana Roo for bike that has taken me thousands of miles this year, and helped me stay fast and strong on a tough course (and no flats / mechanicals – seriously, what was up with all the flats on the Vegas course??) . Brian at Fast Splits for all his patience in teaching me about my bike, and keeping it in tip-top shape. Jim at Be Well Boston, who helped me get through the season injury-free and my body fully recovered between races. Powerbar for fueling all my workouts and races. Normatec for my daily recovery to allow me to bounce back quickly after tough workouts. Rudy Project & Pearl Izumi for helping us look good and be fast. After the race, I took 2 weeks off, and now I’m back to training, building up for the 2014 season. It’s a little weird to have my off-season when most everyone else is still ramping up for their fall A races, but I like that I have some extra time to build a good base to take me into next year. Expect to see me toe the line at some local road races this fall/winter! As for 2014…. plans are in the works, but I’m going to keep you in suspense for now :). In other news… next week, I’m going to Kona for the IM World Championships! I can’t wait to be there to cheer on all 30 (!) QT2 teammates that will be racing, and experience the big show in person. I’m so lucky to have the opportunity to go this year, thanks to a few special people. Some day, I’ll be there to race…but for now, I’m going to enjoy all the hype and excitement as a spectator! Awesome Race Report! With your talent and dedication in training, you are going to go very far in this sport. I will be cheering for you. Congrats! So impressive I can’t put it into words! Congratulations! It sounds like you really kept your head and made thoughtful decisions while dealing with the physical obstacles — and a podium spot to boot! Congrats on making the podium and maintaining mental toughness on a race day with unexpected obstacles!